One of the card games that many of us learn, even before we've become "gamers" is War. You know, where you've got a split deck of 52 cards and flip over the top card and see who wins. Pretty simple and not a lot of strategy involved. Well, what if you were to take some of those basic mechanics and add to them? 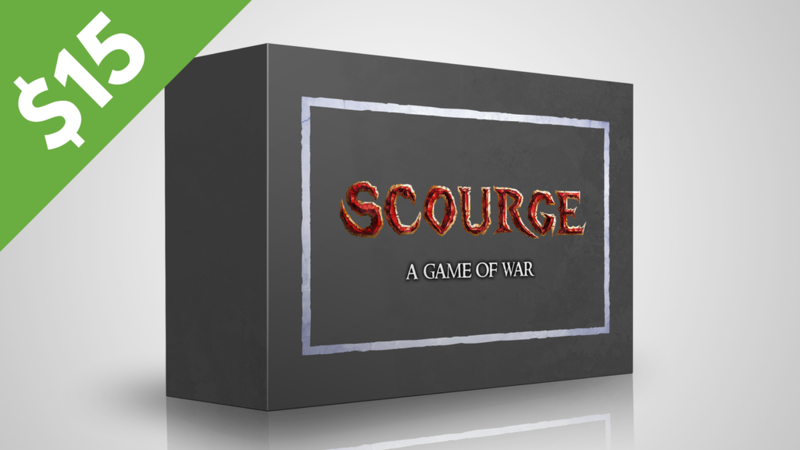 Then you might have something like Scourge, a new card game that's up on Kickstarter now. Each game consists of 2 decks - a Red Deck and a Blue Deck. Each deck is balanced, with soldiers, archers, sorcerers, healers, and much more. Players take turns sending out troops from their hand onto the battlefield - if the opposing army cannot counter or defend, he or she must take damage. Players can capture and sacrifice prisoners of war to unlock new abilities, upgrade already learned abilities and more. While some cards attack an opposing army, other cards can attack an opponent's King directly. If Army Health or King Health reaches zero, that player loses, and the last surviving army wins! The campaign is about 4/5 of the way to their goal with a week left to go.